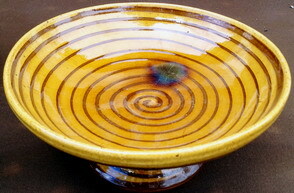 The Piedouche was used to rinse your hands when entering the Provencal/Dauphine kitchen. This amazing classic spiral design was made in the Northern Provence/Dauphine region of Gap and can be found in the book 'Poteries Meridionales'. Perfect condition at 13 x 6.